That's the GoodNotes 4 app, in case you were wondering! Apple debuted two ads over the weekend, both showing off features of the iPad Pro, running iOS 11. 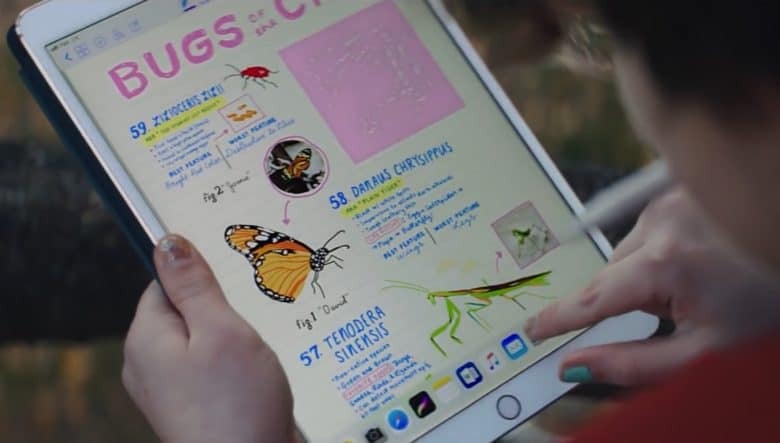 The first ad, “Take Notes,” depicts how the Apple Pencil can let people write down handwritten notes, complete with doodles. The second, “Augmented Reality,” shows off Apple’s ARKit technology by demonstrating the way that apps like Ikea Place can drop virtual items of furniture into the real world. Both ads are part of an ongoing campaign by Apple to convince you that, “Your next computer might not be a computer” — meaning that the iPad Pro’s capabilities are sufficient that, for many people, it will replace what they need from a PC. Whether that message is resonating with customers isn’t clear. Despite its efforts to convince us that we are in a post-PC world, Mac shipments rose in a competitive computer market last year to give Apple a greater market share. At the same time, iPad sales held strong at 10.3 million in Apple’s last recorded quarter. What may be doing slightly less well, however, is ARKit, Apple’s augmented reality platform. Although it’s still early days, the platform has seen only modest adoption since first being introduced. We wouldn’t be at all surprised to see a whole ad campaign built around ARKit later this year. Do you use the iPad Pro as a Mac replacement? What do you think of augmented reality so far? Let us know your thoughts in the comments below.